The demand situation is benign, but food businesses continue to suffer from margin pressure due to high labour and energy costs and stiff competition. In 2016 the general demand situation for the Belgian food sector remained benign, mainly due to increased exports. The industry is expected to expand again in 2017, with value added growth forecast to increase 1.8%. Businesses located in the Flanders region account for more than 80% of Belgian food industry turnover and exports. Employment figures have remained stable over the past couple of years, with 82,000 people directly and 128,000 indirectly employed in 2015. After decreasing in 2013 and 2014, business investments rose again in 2015, to EUR 996 million. The food sector continues to positively contribute to the Belgian trade balance. Increasing exports are key for further sector growth, with quality and safety standards as well as process and product innovation being key selling points overseas. Main destinations remain France, Germany, the Netherlands and the UK, while exports to the US, Japan and the BRIC countries are increasing (mainly alcoholic beverages and chocolate). Distant foreign markets provide the best growth opportunities (in 2015 food exports to those markets increased 19%). 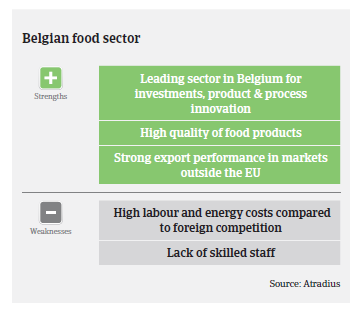 However, competition remains fierce in the global food market, and the profit margins of many (mainly smaller) Belgian food businesses are negatively affected by high energy and labour costs. Labour costs are almost 20% higher than in France, Germany and the Netherlands, countries which host big competitors. Energy costs have increased substantially due to additional charges imposed by the government. Another issue is volatile commodity prices. Food producers are forced to pass on any price increases to their customers, otherwise their yields would come under even greater pressure. Additionally it remains to be seen how the recent Brexit decision will affect Belgian food exports to the UK in the mid- and long-term. In order to remain domestically and internationally competitive, further investments in innovations and technological specialisation are necessary. Beverages is a profitable subsector, which benefits from increasing international demand. 2016 sporting events (the European football championship and the summer Olympics) have helped to drive demand. 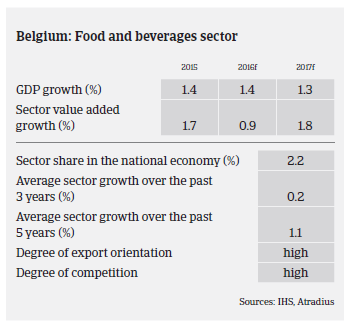 However, an additional tax on sugary beverages has negatively affected sales, leading to increased cross-border shopping of Belgian residents. Excise taxes on alcoholic beverages have also increased. The dairy segment suffered in 2015 as a result of the abolition of EU milk quotas, but the market is showing signs of stabilisation after a volatile period. Further consolidation in this subsector is expected. The meat subsector suffers from margin pressure and high competition, while a consolidation process is on-going. Some meat exporters are negatively affected by the Russian food import ban, which has also increased pressure on the fruit and vegetables segment. 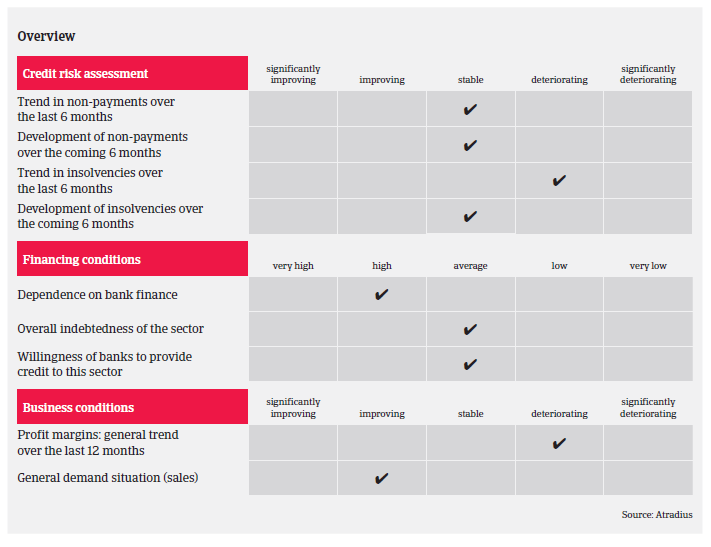 While dependence on bank finance and businesses gearing are generally high in the food industry, banks are generally willing to provide credit to the sector. On average, payments in the Belgian food sector take around 60 days. However, much longer payment periods are not unusual for very large food businesses with robust market leverage. Protracted payments are not unusual, especially when peak periods lead to liquidity issues for some food businesses. However, non-payment notifications are not expected to show major increases in the coming months. The level of food insolvencies is average compared to other Belgian industries, and a slight increase was noticed in H1 of 2016. That said, no major increases are expected in the coming months. Our underwriting stance remains generally neutral to cautious, given the cost and margin pressure for many businesses in the industry (affecting mainly smaller companies active in the dairy and meat segments). We take into account the seasonal trends that affect most food subsectors and manage credit exposure through time-limited cover. Despite our generally cautious stance, we try to find ways to provide cover by obtaining additional information, for instance, good payment experience or a guarantee from a stronger parent company.